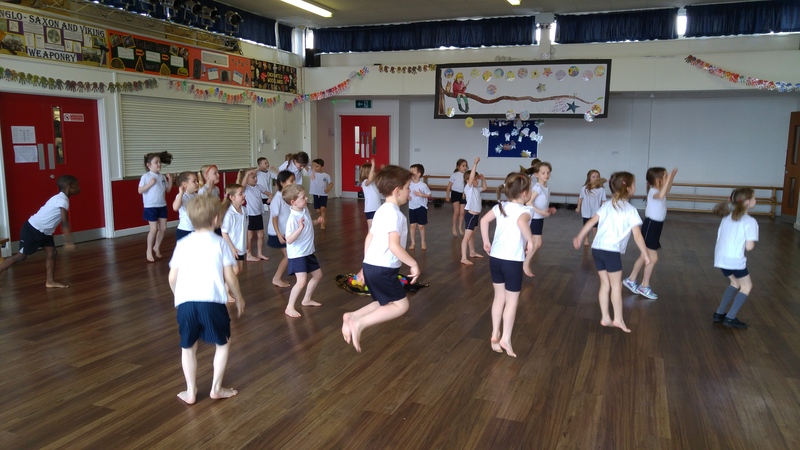 This term’s Educating Dance classes at Miers Court Primary were ‘big’ in so many ways. From the fact we were studying Dinosaurs (some are very big!) to the number of activities and length of the finished dance, it was all fantastic and I really enjoyed myself. I was immediately surprised by the number of dinosaurs the group could name. Our starter activity was a quick fire name the dinosaur game. Each class had to name as many as they could in just 1 minute. The first time we averaged 8. By the end of term we reached 14 in a minute. Most could even say Confuciousornis and Ornithomimids by the end! Warm up was all about the role of a Paleontologist. In cool down we nursed eggs. I showed the groups a photo of what a dinosaur nest could look like and we pretended the liquid gold looked just like it. In between the dancers choreographed movements about dinosaurs. Three movements each for six dinosaurs meant a huge amount to remember, but they did it! We also played Dinopposites. 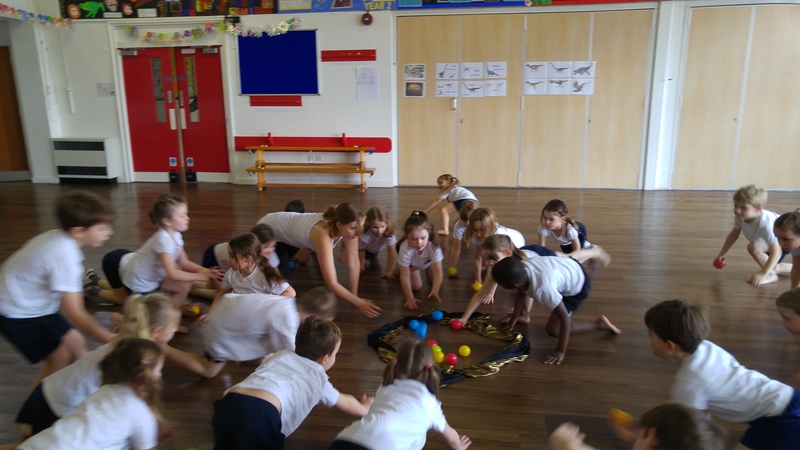 I showed the groups pictures of tall, short, heavy, light, fast and slow dinosaurs and, in pairs, they choreographed their own movements to represent the dinosaurs. 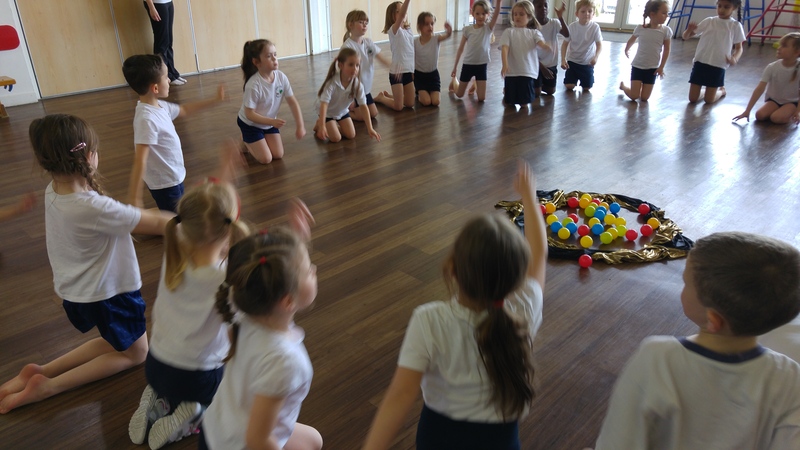 We learnt how, in creative dance, everyone in the room can have a different idea though each pair knew their own movements and did the same week by week. I think this has been one of my favourite themes to work into a cross-curricular dance class. I didn’t know much about dinosaurs before I started and had to do a lot of research. Then I had plenty of ideas and the children seemed to enjoy it all. I’d also like to thank the Year 1 adults who have helped throughout the term. They have excellent memories for dance and were a tremendous help when it came to filming! I hope they are just as proud of their classes as I am! Some of the video footage and photos were made into a short ‘movie’ by Google Auto Awesome and it can be viewed below and on YouTube.